The history of road traffic accident research began in the US. The physicist William Haddon started in the beginning of the 1950ies the first accident data collection at the scene of the accident. In Europe accident research started in the late 1950ies – in Sweden the safety impact of safety belts was proven by analysis of real-world accidents. 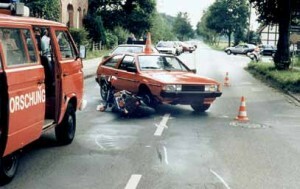 In Germany the car manufacturer started in the 1960ies the collection of accident data at the scene. Here mainly Daimler-Benz, Ford, Opel and Volkswagen need to be mentioned. The collection of the vehicle manufacturer focused on cars of their own brand. In the 1960ies and beginning of the 1970ies the number of accident causalities increased in such a fast manner that 1971 the highest number of road fatalities with approx. 20,000 fatalities in the year 1971 was recorded. Following that high number of fatalities the German government became active and research teams in Berlin, Hannover and Heidelberg started to collect accident data at the scene. In Hannover the former head of the Trauma Surgery Department of Medizinische Hochschule Hannover Professor Dr. Harald Tscherne cooperated with Technischen Universtität Berlin (Professor Appel) and founded the MHH Accident Research Unit. The NATO group on environmental issues piloted a study on accident analysis due to the high number of road traffic fatalities. Besides Great Britain, France and the Netherlands also Germany (represented by the German Federal Highway Research Administration – BASt) contributed to this pilot study. After finalising this project the German accident research project was continued by the cooperated team formed by MHH and TUB. The cooperation led to an interdisciplinary approach combining medical, technical and mental disciplines. While in the beginning of the Hannover Accident Research Unit was formed by the Medizinische Hochschule Hannover and the Technische Universität Berlin also the technical part was covered by MHH staff after a short period in time. The results of the Accident Research Unit Hannover have been used at national and international level in order to improve road safety. The approach of the Hannover accident research team has been used as a template for other accident research teams world-wide. The focus of the accident researcher changed over years. While in the beginning the individual accident and the resulting injuries were the main focus in the following statistical analyses of the collected accident data in order to have broader view on the accident situation including the injury risks and injury causation were becoming more important. The accident collection allowed the development and assessment of several measures to avoid accidents and injuries or at least to reduce the harm resulting from accidents. Following that especially the passive safety improved significantly over time resulting in a considerable reduction of road traffic fatalities from 20,000 in the year 1971 towards less than 4,000 today. Now one of the main focus of the accident collection is to understand accident causation in order to develop measures to avoid accidents completely.